I know I haven't talked about it much lately, but I'm STILL buying prescription glasses on the internet. I CAN'T BE STOPPED! I blame these online sites that keep getting better inventory and then emailing me about it. It's all their fault, right? I figured it was about time I did another round up of places where you too can buy prescription glasses online! One of the first places I ordered from. They have a wide selection and they ship pretty fast. They've updated their site in the last year or so and you can mark frames as favorites and I think there's more search options now. They also keep sending me e-mails about new frames they've added. That's how I ended up with the black cat-eye pair in the middle in the photo above. Another place I've ordered many frames from. They've also revamped their site in the past year, though I actually find it harder to search (they removed a bunch of the search options). The do have a wide selection and decent prices. If you join their e-mail list they frequently have coupons and specials. This was one of the last places I used to check for frames, but now it's one of the first. They've been gradually adding some retro styles that I REALLY like (the black bling-y frames in the photo above are from them), so I keep going back to check for more. The site is pretty easy to navigate and the prices are reasonable. They're another one that frequently send out specials and coupons via e-mail. They tend to be a bit pricier than the other 3, but they have a nice selection and they frequently have specials and sales (they seem to do 2 for 1 deals pretty often). The rest of these are newer sites that I have not yet ordered from. The temple length on the frames tend to be too big for me, so I've hesitated ordering. 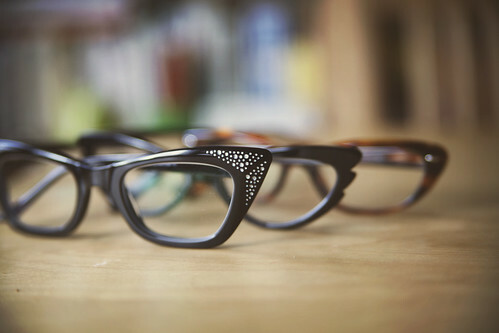 However, they all seem to have very fashionable/popular frame styles and are still cheaper than the optometrist. This site was formerly called Spex Club.They went though a little re-brand last month but still have the same prices ($88) and selection, plus free shipping and returns. Stylish frames for $95! They have a try at home program, free shipping, and free returns. I believe for every pair sold they donate a pair to someone in need. I just wish their glasses weren't so big! Otherwise, I would have ordered a pair by now for sure. Their prescription glasses are $99. They do offer free shipping, and have a try at home option. They seem to have a pretty nice selection as well. They also donate 3% of every purchase to five different charities. You get to pick which one you'd like your purchase percentage to go to. It looks like their prescription frames run around $125. They don't have a huge selection, but they provide a lifetime warranty, 30 day returns, and free shipping. They're also doing all of this to support the Pixie Project. This is what it says on their site, "Every Amy Sacks Eyewear purchase helps provide food, shelter and medical care to animals in need." That alone is enough to make me want to order a pair. Prescription glasses are $99, and they have a virtual try on thing on the site. Their frame selection seems to be pretty good, though I haven't spent too much time browsing around. Yet. They also donate 1% of their sales to Helen Keller International's Child Sight program in New York, which seeks to improve the vision and academic potential of low-income children who have limited access to basic vision care. So there you go! Quite a range...from cheap glasses to slightly more expensive glasses for good causes! I think pretty much every site has a help or FAQ section, so if you don't find what you need from any of my ramblings on prescription glasses, those sections on any of these sites would be a good resource. Now, go forth and buy glasses! \n\n\nI know I haven't talked about it much lately, but I'm STILL buying prescription glasses on the internet. I CAN'T BE STOPPED! I blame these online sites that keep getting better inventory and then emailing me about it. It's all their fault, right?\n\nI figured it was about time I did another round up of places where you too can buy prescription glasses online!\n\nFirst though, you should read my original post about buying frames. It can be a little overwhelming if you haven't done it before. After you read that, you're going to want to go browse for some frames, and I've definitely got you covered there! I did a similar list back in March, but I've come across a bunch of new sites since then: \n\nZenni Optical\nOne of the first places I ordered from. They have a wide selection and they ship pretty fast. They've updated their site in the last year or so and you can mark frames as favorites and I think there's more search options now. They also keep sending me e-mails about new frames they've added. That's how I ended up with the black cat-eye pair in the middle in the photo above.\n\nGoggles4U\nAnother place I've ordered many frames from. They've also revamped their site in the past year, though I actually find it harder to search (they removed a bunch of the search options). The do have a wide selection and decent prices. If you join their e-mail list they frequently have coupons and specials.\n\nEye Buy Direct\nThis was one of the last places I used to check for frames, but now it's one of the first. They've been gradually adding some retro styles that I REALLY like (the black bling-y frames in the photo above are from them), so I keep going back to check for more. The site is pretty easy to navigate and the prices are reasonable. They're another one that frequently send out specials and coupons via e-mail.\n\nGlasses USA\nThey tend to be a bit pricier than the other 3, but they have a nice selection and they frequently have specials and sales (they seem to do 2 for 1 deals pretty often). \n\n\nThe rest of these are newer sites that I have not yet ordered from. The temple length on the frames tend to be too big for me, so I've hesitated ordering. However, they all seem to have very fashionable/popular frame styles and are still cheaper than the optometrist.\n\nLookmatic\nThis site was formerly called Spex Club.They went though a little re-brand last month but still have the same prices (\$88) and selection, plus free shipping and returns.\n\nWarby Parker\nStylish frames for \$95! They have a try at home program, free shipping, and free returns. I believe for every pair sold they donate a pair to someone in need. I just wish their glasses weren't so big! Otherwise, I would have ordered a pair by now for sure.\n \nMezzmer\nTheir prescription glasses are \$99. They do offer free shipping, and have a try at home option. They seem to have a pretty nice selection as well. They also donate 3% of every purchase to five different charities. You get to pick which one you'd like your purchase percentage to go to.\n\nAmy Sacks\nIt looks like their prescription frames run around \$125. They don't have a huge selection, but they provide a lifetime warranty, 30 day returns, and free shipping. They're also doing all of this to support the Pixie Project. This is what it says on their site, \"Every Amy Sacks Eyewear purchase helps provide food, shelter and medical care to animals in need.\" That alone is enough to make me want to order a pair.\n\nBon Look\nPrescription glasses are \$99, and they have a virtual try on thing on the site. Their frame selection seems to be pretty good, though I haven't spent too much time browsing around. Yet. They also donate 1% of their sales to Helen Keller International's Child Sight program in New York, which seeks to improve the vision and academic potential of low-income children who have limited access to basic vision care.\n\n\nSo there you go! Quite a range...from cheap glasses to slightly more expensive glasses for good causes! I think pretty much every site has a help or FAQ section, so if you don't find what you need from any of my ramblings on prescription glasses, those sections on any of these sites would be a good resource.\n\nNow, go forth and buy glasses!